The ProGear 750 is a hydraulic rower featuring a dual cylinder resistance system similar up to a point to the Stamina Orbital 1215. However, it also incorporates several other elements which increase its versatility. 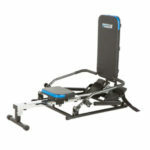 Therefore, this machine offers the possibility to perform several other exercises not just the regular rowing. The ProGear 750 rowing machine features a frame made of steel and coated with a corrosion-resistant paint finish. 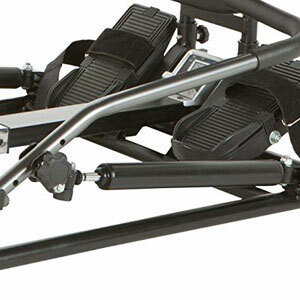 As opposed to other similar trainers, such as the Stamina BodyTrac Glider 1060, its sliding rail is also made of steel, and not from aluminum. But as opposed to the rest of the frame, it has a chrome finish. The oars also have a chrome finish. Due to the full-steel construction and the extra large pad element, this rowing machine is a bit heavier than most other hydraulic rowers. With the frame fully assembled, it weighs approx. 54 lbs (24.5 kg). This weight provides an excellent stability. The main part of the frame rests on a rectangular steel tubing base. However, the rear part of the rail features a foldable stabilizer. This stabilizer has three adjustment positions and depending on its selected position, you can obtain a bit of incline for the rail. The approximate incline positions for the rail are 0°, 3°, and 5°. Therefore, you can achieve a slightly better workout for the legs if you set the rail above the horizontal (0°) position. This ProGear rowing machine is not too large. Its footprint is approx. 53″L x 26.5″W (135 x 67 cm). It does require a larger usage surface, though. It’s recommended to leave at least two feet of clearance all around the unit, in order to be able to extend both oars outward properly, and also change the position of the machine in case you want to perform other exercises. The rower is foldable. The large backrest/pad attaches to the front support tubes via two knobs. Therefore, you can easily remove it and place it over the main rail. The rail slides over the front section of the frame, which reduces the unit’s overall length. Also, the oars can remain folded alongside the rail. These being said, the folded-flat dimensions of the unit are 45.5″L x 26.5″W x 7.8″H (116 x 67 x 20 cm). Thus, it can be stored against a wall, or even under a bed, if there is a clearance of at least 10″ (26 cm). The ProGear 750 rower is equipped with a cushioned seat, designed for optimal comfort. It integrates approx. 2″ (5 cm) of foam cushioning and has a durable, double-stitched vinyl upholstery. The large backrest has the same upholstery and level of cushioning. The base of the seat is made of steel. It is equipped with three sets of rollers. Two sets (four rollers) are placed on top of the rail, while the third (two rollers) is placed under the rail to secure the seat on its rail. The rollers are equipped with ball bearings in order to supply a smooth movement and for the seat. The unit’s rail offers 6″ (15 cm) of adjustment. It also provides enough travel for the seat in order to accommodate users between 4’9″ and 6’1″ (145 – 185 cm). It’s also durable enough to support users up to 220 lbs (100 kg). The seat is approx. 12.5″D x 9″L (31 x 23 cm) while the backrest’s dimensions are 26.5″L x 12.5″W (67 x 31 cm). They provide plenty of contact surface for most users within the size and weight ranges that we’ve already mentioned above. The footrests are made thick nylon material. They have a pivoting design, which enables them to slightly adjust their angle during each stroke. This way, your feet will always be at their optimal position throughout the range of motion. The footrests also have a non-slip surface, rear guards and adjustable straps, so you can perfectly secure your feet on them during rowing. Their length is non-adjustable; however, they are large enough to accommodate feet of all sizes. 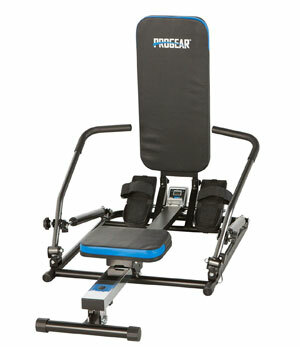 As we’ve mentioned above, the ProGear 750 is a hydraulic resistance rower. Each oar is equipped with its own hydraulic cylinder. Also, each oar has three connection points for the cylinder. So, by attaching the cylinders to the highest notches on their oars, they will fully extend when pulling the oars backward, and therefore, they will generate more resistance. Since each oar has its own cylinder, the oar action is independent; you can exercise using only one oar if you want. Also, the oars can pivot outward. Thus, you can perform a rowing motion similar to real oar action, with a slight outward arm rotation during each stroke. Evidently, this involves more muscles and results in a more consistent workout. But nonetheless, you can also perform a standard (back-forth) rowing motion as well. The hydraulic resistance comes with a minor inconvenience compared to water resistance or air resistance. It does not provide a dynamic response during rowing. In other words, the resistance doesn’t depend on the strength you put behind each stroke. It remains constant. Nonetheless, the machine does provide a very consistent, full-body cardio workout. But a professional sprinter may need the dynamic response in order to train on an Olympic level. 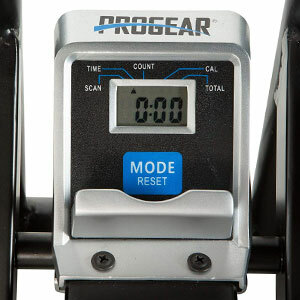 The ProGear 750 rower comes with a basic fitness meter. It doesn’t have built-in programs, Bluetooth, or other fancy features. It also doesn’t have a pulse reading function. So, if you need to track your heart rate during rowing, you will have to use a separate device. The unit features an LCD display which indicates time, count, total count, and calories burned. The count metric indicates how many repetitions you have performed during the current workout, while the total count shows the total number of repetitions performed on the machine. The meter unit is very easy to use. It requires 1 AA battery which is included. It starts up when it detects oar movement, but also has a sleep mode to which it will enter after a few minutes of inactivity on the machine. It has only one button which covers two main functions. One is selection; by pressing it repeatedly, you can select any of the metrics to be shown on the display, or you can select the Scan Mode, which rotates all the metrics, showing each one for a few seconds, then moving to the next and so on. The other function is Reset. You can press it and hold it in order to clear all the values on the meter to zero. A tablet or phone holder is also integrated into the meter unit. It’s not an extremely large accessory, but should be able to provide support for any type of tablet or smartphone. Of course, depending on the exercise that you want to perform, you will have to adjust the position of the large pad of the unit, the seat, and the position of the machine. For example, if you want to perform bent over rows or shoulder presses, the part of the frame with the oars and cylinders needs to be in upright position, while the large pad should be attached to the main unit, and on the floor. 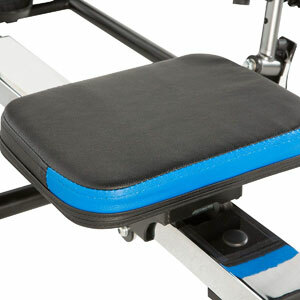 Or, for press downs or pec flies, the large pad should be attached to the main rail of the unit, as an extension to the seat. With the large pad in this position, you can also perform dumbbell exercises, as long as your bodyweight plus the combined weight of the dumbbells does not exceed the maximum weight limit of the unit (220 lbs). Most of the unit comes already assembled. You only have to attach the large pad depending on the configuration you want for the machine. The manual provides all the necessary instructions. The whole unit should be ready to use within a few minutes from unboxing. For maintenance, the joints of the machine may require lubrication. The rail of the rower should be kept clean, free of any dirt, textile fibers or any other small objects that may cause damage to it or to the seat rollers. Other than this, it’s recommended to periodically check for loose bolts and parts, and re-tighten them if needed. Not a machine for users taller than 6’1″. 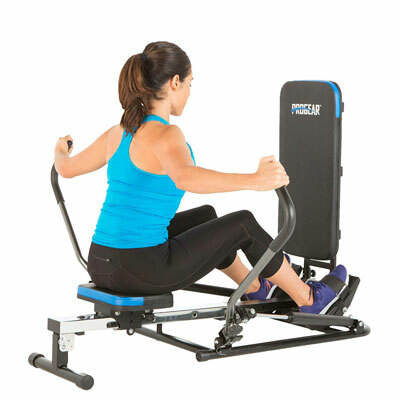 The ProGear 750 is a hydraulic rower equipped with a dual cylinder resistance system. It features a set of pivoting oars which promote a natural rowing motion. 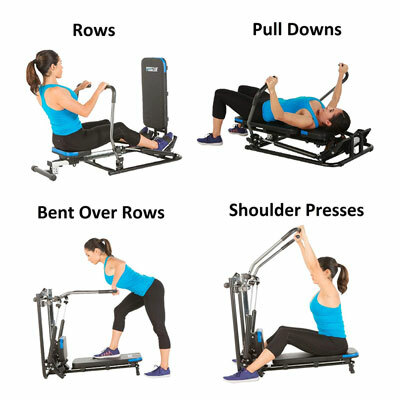 It’s a versatile machine which offers the possibility to execute more than 10 exercises, not just rowing. It’s an excellent trainer for a full-body cardio workout, muscle toning, weight loss, or recovery training. And finally, it’s quite an affordable fitness machine, currently available for less than $150.